HOUSTON, WILLEMSTAD - Since the removal of restrictions on exporting U.S. crude oil in December 2015, the number of countries receiving exported U.S. crude has risen sharply. These exports have occurred despite a sustained narrow price premium of international crude oil prices over U.S. domestic crude oil prices, the many costs associated with arranging cargoes for export, and falling U.S. crude production. In the first five months of 2016, U.S. crude oil exports averaged 501,000 barrels per day (b/d), 43,000 b/d (9%) more than the full-year 2015 average. This rate of growth is significantly slower than before the restrictions were lifted, when year-over-year growth from 2012 to 2013 was 100%, and then 162% from 2013 to 2014 (Figure 1). However, after the lifting of restrictions, the number and variety of destinations for U.S. crude oil exports has changed. So far in 2016, crude oil was exported to 16 different nations, six more than 2015 and double the number of destinations in 2014. Before the removal of export restrictions, most U.S. crude oil shipments were to Canada. In recent years, crude exports to destinations other than Canada were re-exported volumes of foreign crude or an occasional cargo of Alaskan crude, which was exempt from export restrictions. In March 2016, total crude oil exports to countries other than Canada exceeded those to Canada for the first time since April 2000, 259,000 b/d versus 249,000 b/d. In May 2016, when total U.S. crude oil exports reached 662,000 b/d; exports to countries other than Canada exceeded exports to Canada by 46,000 b/d. Aside from Canada, the largest and most consistent U.S. crude export destination for the first five months of 2016 has been Curaçao; exports averaged 54,000 b/d through May. 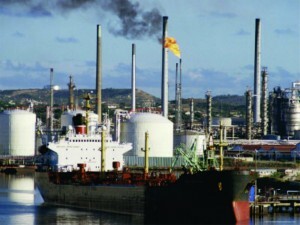 Petróleos de Venezuela (PDVSA), the state-owned oil company of Venezuela, operates the 330,000 b/d Isla refinery in Curaçao, as well as crude and petroleum product storage facilities on the island. Trade press reports indicate that U.S. crude exports to Curaçao are likely being used as diluent, blending a light U.S. crude with a heavy Venezuelan crude, for either processing at the Isla refinery or for re-export to PDVSA customers. Exports to the Netherlands, the second-largest non-Canadian destination for U.S. crude oil, averaged 39,000 b/d through the first five months of this year. Two of the three cities that collectively are the large refining and petroleum product trading hub of Amsterdam, Rotterdam, and Antwerp, known as the ARA, are located in the Netherlands. Other Western European nations, including Italy, France, and the United Kingdom, also rank high on the list of U.S. crude oil export destinations. The Marshall Islands, a group of islands in the Pacific Ocean, is the fifth-largest non-Canadian destination for U.S. crude oil exports in 2016, averaging 14,000 b/d through May. With no refineries, the Marshall Islands are unlikely the final destination, but rather may be the location of ship-to-ship transfers for delivery to destinations in Asia, or a point at which a cargo of crude oil would await a buyer in Asia. U.S. Customs and Border Protection documentation requires the final destination of an export, if known. Therefore, cargoes that will undergo ship-to-ship transfer or that do not have a buyer prior to loading will cite the jurisdiction of the transfer, not the cargo's actual final destination. The costs involved in exporting a cargo of crude oil can vary significantly. Transporting crude to a port, storage, loading, shipping, and other costs typically require large price spreads to make a transaction economic. Recent exports are occurring during a period when the price of Brent crude oil (the benchmark for global seaborne crude) has held a narrow premium to West Texas Intermediate (WTI, the U.S. benchmark), limiting the positive economic options for exporting U.S. crude. Through early August 2016, WTI averaged about $0.31 per barrel (b) less than Brent, despite a recent widening to $1.08/b for the week ending July 1. Available shipping options can provide opportunities for crude exports despite a narrow price spread. For example, the recent cost of booking a tanker for a spot shipment of crude oil has been the lowest since 2009. Also, if either a buyer or a seller of exported crude oil has a tanker on time charter (meaning the vessel’s time has already been paid for a set period, fixing its cost), the vessel may operate independently of tanker rates. Another shipping option is to book a back-haul voyage, the trip a tanker would normally make empty while returning to a port to load its next cargo. Back-haul voyages can be significantly discounted from regular tanker rates. Refineries in the ARA and in the rest of Western Europe actively trade with markets and refineries in the United States, using both clean (refined cargoes) and dirty (less refined or unrefined cargoes) tankers. Trade flows between Europe and the U.S. Gulf Coast, which primarily use dirty tankers for transporting crude and less refined products such as residual fuel oil, provide opportunities for back-haul cargoes of U.S. crude oil. In addition, sellers of U.S. crude can use several methods to entice buyers despite unfavorable price spreads. A particular cargo or grade of crude oil can be discounted from a benchmark based on quality variations, such as API gravity, sulfur content, or other specifications. With the hope of continued purchases in the future, marketers of U.S. crude for export may offer buyers price discounts on sample or test cargoes, so that refiners may become more familiar with the crude and its compatibility with their refinery and desired product yield. This may explain some of the sporadic, typically small-volume crude oil export patterns to some countries in Asia, Europe, and elsewhere. Sustained and significant increases in U.S. crude oil exports, however, likely require more than lower shipping costs and sporadic purchases. It would require increased U.S. crude oil production and a significantly wider Brent-WTI price spread, neither of which are projected in EIA’s August Short-Term Energy Outlook.